The following notes are based on an overview by Peter Kreeft. See also his book, Socrates Meets Marx: The Father of Philosophy Meets the Father of Communism (St. Augustine’s Press, 2012). A German philosopher-economist and a revolutionary socialist who founded Communism. What is the significance of his philosophy? Marxism is not the most important, the most imposing, or the most impressive philosophy in history. But until recently, it has clearly been the most influential. In just two generations, Marxism inundated one-third of the world—a feat accomplished only twice in human history (by early Christianity and by early Islam). What is Marx’s most famous work? 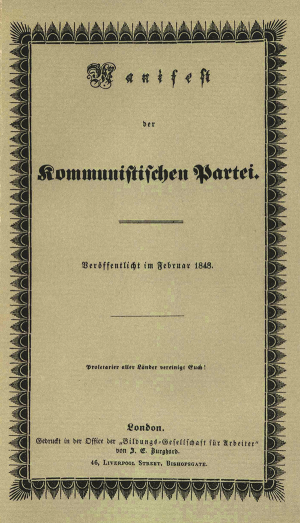 What is the genre of The Communist Manifesto? It is essentially a philosophy of history, past and future. What was Marx’s view of the past? What was Marx’s view of the present? the bourgeoisie (the “haves”) — the owners of the means of production. the proletariat (the “have-nots”) — the non-owners of the means of production. What was Marx’s view of future history? The proletariat (the have-nots) must sell themselves and their labor to the bourgeoisie (the owners) until the communist revolution. How was Marxism structurally and emotionally like a religion? Political purges within the party to maintain ideological purity are the new divine judgments on the waywardness of the Chosen and their leaders. Where did Marx’s idea’s come from? What was Marx’s relationship to Hegelian philosophy? What radical ideas did Marx inherit from Hegel? Monism. Everything is one; the distinction between matter and spirit is illusory. For Hegel, matter was only a form of spirit; for Marx, spirit was only a form of matter. Pantheism. The distinction between Creator and creature is false. For Hegel, the world is made into an aspect of God (pantheism); for Marx, God is reduced to the world (atheism). Historicism: Everything (even truth) changes; there is nothing above history to judge it; therefore, what is true in one era becomes false in another, or vice versa. Time = God. Dialectic. History moves only by conflicts between opposing forces, a “thesis” vs. an “antithesis” evolving a “higher synthesis.” This applies to classes, nations, institutions and ideas. The dialectic continues until the kingdom of God finally comes. Hegel virtually identified this kingdom with the Prussian state. Marx internationalized it to the worldwide communist state. Necessitarianism, or fatalism. The dialectic and its outcome are inevitable and necessary, not free. Statism. There is no eternal, trans-historical truth or law, therefore the state is supreme and uncriticizable. Marx again internationalized Hegel’s nationalism. Militarism. There is no universal natural or eternal law above states to judge and resolve differences between them, therefore war is inevitable and necessary as long as there are states. What was Marx’s economic reductionism? Within man, thought is totally determined by matter. Man is totally determined by society. Society is totally determined by economics. How does Marx deal with the objection that Communism abolishes many good things? How does Marx respond to the objection that Marxist materialism contradicts itself? The objection: If ideas are nothing but products of material and economic forces, then communist ideas are only that too. To attack the grounds of thought is to attack one’s own attack. Marx sees this and admits it. But the functions of words, in his view, is not to prove what is true but to encourage the revolution. Marx is essentially a pragmatist. What are some further objections to Marxism? Marx’s appeal for “Working men of all countries, unite!” even if pragmatic, is still self-defeating. Marx believes in fate, not free will, and the revolution is inevitable. Therefore, he can’t appeal to free will while denying it. The predictions simply have not worked. The revolution did not happen when and where Marxism predicted. Capitalism did not disappear—nor did the state, the family, or religion. Communism has not produced contentment and equality anywhere it has gained power. All Marx has been able to do is to play Moses and lead fools backward into the slavery of Egypt (worldliness). The real Liberator is waiting in the wings for the jester who now “struts and frets his hour upon the stage” to lead his fellow “fools to dusty death” the one topic Marxist philosophers refuse to face.